(Washington D.C. – February 5, 2019) Last year, the silver market faced a challenging environment which was reflected in a muted price performance. Preliminary estimates point towards a minor 0.3 percent increase in total supply whereas demand contracted 3 percent. A slowing Chinese economy, coupled with rising U.S. interest rates, an equity market bull run, and global trade tensions, affected the price performance across many markets, including gold and silver. This year, we expect the sentiment to be more supportive for the silver market. The start of 2019 has already proven to be good for silver investors. The U.S. Mint for example, sold 12 percent more American Eagles in January compared to January 2018. In addition, the expected slowdown in the U.S. FED rate hiking cycle should also benefit silver, which in comparison to gold, has a very attractive price point based on the high gold:silver ratio at around 82. Against this backdrop, the Silver Institute provides the following insights on 2019 silver market trends. Silver demand from industrial fabrication, responsible for approximately 60 percent of total demand, is forecast to rise modestly in 2019. We expect most sectors to record reasonable growth based on silver’s use in a wide variety of applications. Silver demand from brazing alloys and solders as well as electrical and electric applications is expected to rise again this year. This is on the back of continued demand from the automotive sector, which uses an increasing amount of applications, such as safety features, window defogging and infotainment systems, and for electric and hybrid vehicles. We also forecast growth in silver’s use in a variety of additional sectors, such as water purification, chemical applications, LED lighting, flexible electronics and screens as well as anti-microbial applications in textiles. Photovoltaic (PV) demand has been expanding considerably in recent years due to various countries stepping up the pace to diversify their energy generating portfolio away from conventional fossil fuels and towards a higher share of renewable sources. Even with legislative changes in China, coupled with global overstocking and continued attempts at thrifting, PV demand will still be very supportive of silver usage, as many governments will continue to provide incentives to install more solar power. Indeed, global solar capacity additions are likely to be above 100 GW per year over the 2018-2022 period. Even though growth of solar capacity additions in China slowed modestly last year, that slack is expected to be offset by other countries, such as India, Australia and various European countries in the coming years. India is expected to continue to be one of the largest silver consumers in 2019. Silver imports reached nearly 225 million ounces (Moz) last year, which was over 220 percent higher compared to 2017. Silver imports fell in India after the implementation of the demonetization plan at the end of 2016 and the introduction of the goods-and-services-tax (GST) in mid-2017, which reduced the amount of cash in circulation that was previously used for silver imports. Jewelry demand is expected to record a solid year of growth in 2019, with Thailand set to be one of the driving forces behind the rise. In the United States, silver jewelry will remain a popular alternative to lower carat gold items, driven by many issues, but especially female self-purchases. Globally, silver jewelry is expected to continue to expand, due to its diversity of design, fine quality and excellent retail margins. Exchange traded products (ETPs) are forecast to expand by 8 million ounces this year. Silver-backed ETPs are “stickier” than other precious metal products, as a majority are held by retail investors, rather than institutional investors. Silver physical investment demand is likely to increase by approximately 5 percent in 2019. Bullion coin demand has been strong in the United States during January of this year, and we expect sentiment in Europe, which rose by 6 percent in 2018, and India to be supportive of global growth as the year continues. 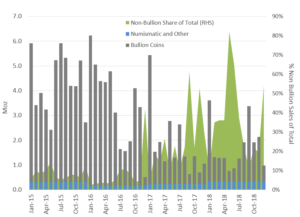 Bullion coin demand in the U.S. fell last year, but non-bullion silver coins rose for the second consecutive year by 42 percent (see chart above). Silver mine production is forecast to decline by 2 percent this year. While we expect a small rise from silver recovered in gold mining, all other primary and by-product production is expected to fall, except for supply from lead/zinc operations which are forecast to rise this year. Silver scrap supply is forecast to pick up modestly in 2019, following four consecutive years of stable scrap flows. That will be mainly a function of scrap generated from industrial processes but also from jewelry items, which tend to be strongly price elastic. The silver market balance (total supply less total demand) in 2019 is projected to be the third consecutive year, within the boundaries of margin, where all the silver produced is absorbed by the various downstream sectors. We expect the silver price to strengthen this year to post an average price of $16.75, a 7% increase over the 2018 average price based on the LBMA Silver Price. The volatility in the equity markets is motivating investors to look for alternative options such as precious metals, which will boost silver investment.